Few revolutionaries, past or present, have devoted their entire adult lives to the socialist cause as full-timers. Gerry Foley was one of them. He died unexpectedly on April 21 in San Cristóbal de las Casas, in the mountains of Chiapas, Mexico’s poorest state. Gerry spent 50 years fighting—at near poverty wages—to free humanity from every form of capitalist barbarity, oppression, and exploitation. He did it with a twinkle in his eye and with an engaging passion for all things human—and thoroughly enjoyed every moment. Gerry was 73. He died less than a week after moving from his semi-retirement residence in Mérida, Mexico, to San Cristóbal, perhaps from the exertion of moving his enormous collection of books into his newly rented home. His friend Pete, on the scene at the time, told us that Gerry had just left a social event in the large communal area of his apartment complex, where he was chatting with some young people. He returned to his apartment extremely short of breath, immediately collapsed to the ground, and died a few minutes later, likely of a heart attack. Gerry was among Socialist Action’s most dedicated and talented comrades. Those who knew him will immediately recall his generous spirit, depth of knowledge and analysis, brilliance of exposition, love of life in all its diversity, and enduring friendship. Gerry not only read in about 90 languages; he was fluent in more than a dozen, often serving as translator whenever his skills were required. His uncommon language facility was matched by a deep understanding of the history and culture of each nationality whose language he had mastered. Books were Gerry’s sole prized possessions. He had a collection of perhaps 10,000 scattered from California to Alabama to Mexico. Gerry, fluent in Gaelic, was likely among the most informed revolutionaries on Irish history and politics. The Irish struggle for liberation, no matter the setbacks, was never far from his consciousness. Perhaps the socialist cause of the renowned Irish Marxist and Republican, James Connolly—among his heroes—appropriately expressed Gerry’s credo almost 100 years later. Connolly observed that “a real socialist movement can only be born of struggle, of uncompromising affirmation of the faith that is in us. Such a movement infallibly gathers to it every element of rebellion and progress, and in the midst of the storm and stress of struggle solidifies into a real revolutionary force.” In his own talks, Gerry expressed similar sentiments many times. Gerry spent over a year in Ireland working with the Irish comrades, including Bernadette Devlin McAliskey, Northern Ireland’s fiery socialist leader and the youngest woman elected to the British parliament. As a professional journalist writing articles for the world Trotskyist press, Gerry’s insights into Irish politics served to inform the revolutionary politics of a generation of political activists. Decades later, in 1997, Gerry headed the San Francisco-based Committee to Free Roisin McAliskey, Bernadette’s daughter, who was imprisoned and tortured by British authorities as she and her supporters worldwide defeated a German government-initiated deportation effort based on trumped-up charges of involvement in terrorist activities. Then pregnant, Roisin finally won her freedom but not before being forced to have her baby, while in chains, in a filthy British prison facility. Bernadette, who had won the broad respect of U.S. Black liberation activists decades earlier when she gave to the Black Panther Party the “Keys to San Francisco” (awarded to her by San Francisco’s Board of Supervisors out of respect for her membership in the British parliament), joined Gerry at mass rallies in defense of her daughter. During his speeches, and on virtually any subject, tears often came to Gerry’s eyes as he inserted an Irish reference into his discourse. The Irish struggle for self-determination, the longest in world history, lasting more than 700 years and still uncompleted, was ingrained in Gerry’s consciousness. And if you gave him the opportunity, Gerry would happily recount every major event of those 700 years. No comrade could match Gerry’s deep understanding of the national question—the struggle of oppressed people and nations for self-determination, dignity, and freedom. He was a champion of all oppressed peoples and despised their oppressors with great passion. Gerry’s articles have appeared in socialist periodicals around the world. We will soon be publishing a list of many of them. His spirit and dedication to socialist revolution and to building the Leninist party, the prerequisite instrument for bringing it into being, lives in our party and in its comrades. In his semi-retirement, Gerry remained an honorary member of Socialist Action’s Political Committee, often finding time to join its deliberations via Skype and taking an occasional assignment. He hoped to attend the Socialist Action National Convention in August. In autumn 1960, after graduating from American University in Washington, D.C., Gerry began graduate school at Indiana University (IU), in its Russian and East European Institute. There he met a fellow graduate student in Russian literature, George Shriver, who discussed political issues with him from a Trotskyist position. That same autumn 1960, fate had brought George and Ellen Shriver to IU from the Boston area, where they had been founding members of the Young Socialist Alliance (YSA) earlier in the year. The YSA was the fraternal youth group of the Socialist Workers Party (SWP), the main Trotskyist organization in the United States at the time. As a result of joint work with the YSAers in defense of the Cuban Revolution, Gerry joined the Trotskyist movement. After George, Ellen, and Gerry had left IU, a strong YSA chapter remained behind them. When in 1963 the chapter invited YSA National Organization Secretary LeRoy McCrae to speak on the Black liberation struggle, an Indiana McCarthyite witch-hunting prosecutor, Thomas Hoadley, saw an opportunity to implement an obscure and reactionary anti-communist law. Three YSA members on campus were indicted on charges of “conspiracy to overthrow the state of Indiana by force and violence.” Gerry participated in this important defense effort, soon to become a national and successful campaign for “The Bloomington Three,” Ralph Levitt, Tom Morgan, and Jim Bingham. After years of effort by the YSA and SWP the law was declared unconstitutional, an important civil liberties victory for the entire socialist movement and for all others who understood the importance of organizing broad defense campaigns for victims of capitalist persecution. Gerry defended political prisoners in the U.S. and around the world. He was always among the first to sign up to defend capitalism’s victims everywhere and was often involved in their defense committees. In San Francisco, he was a leader in defense of Iranian political prisoners and a participant in the defense of Mumia Abu-Jamal. In autumn 1962, Gerry moved on to further graduate study at the University of Wisconsin at Madison, where he was an activist in the Fair Play for Cuba Committee, also initiated by the SWP and YSA. Soon afterwards, the October 1962 Cuban Missile Crisis brought the threat of worldwide nuclear war, when the Kennedy administration mobilized the U.S. Navy to confront Soviet ships headed for Cuba with nuclear missiles. The Cubans, who in April 1961 had defeated a U.S.-sponsored invasion at the Bay of Pigs, sought Russian missiles to ensure against another such U.S.-backed invasion. Gerry was active in Cuba’s defense, selling the SWP’s newspaper, The Militant, and supporting Cuba’s right to defend itself from imperialist attack. And he helped to found a YSA chapter at Madison. A few years later, Gerry applied for a job as translator with the United Nations. He filled out an application requiring that he list the names and number of languages that he could translate. He listed 25. Later, his disbelieving interviewer asked Gerry what he meant by 2.5 languages. Gerry replied that the figure was 25, whereupon the interviewer immediately sent for a bevy of language specialists from several UN departments to verify Gerry’s claim. Gerry passed with ease and was surprised that he was offered the job on the spot, but with one condition. The UN had a rule that each member nation had the right to challenge its own nationals before their applications could be approved. Gerry was eventually notified that the U.S. government had vetoed his application. But the outraged staffer who so informed Gerry surreptitiously included Gerry’s uncensored FBI file with the UN’s letter of rejection. Gerry told me that it had recorded virtually every YSA and SWP meeting he ever attended, every party position he held, every public meeting he attended, and his every landlord’s name and address. Thus, in those pre-Freedom of Information Act days, still in the McCarthy era, Gerry inadvertently became perhaps the first American to see his unexpurgated FBI file. He took some pride in that. Gerry soon became a full-time staffer for the SWP, working under the direction of Joseph Hansen in the production of what was then one of the finest weekly revolutionary news magazines in the world, Intercontinental Press (IP). It was Hansen, Leon Trotsky’s secretary during Trotsky’s exile in Mexico, who mentored Gerry in the critical necessity of accuracy in reporting, depth of research, source checking, and clear and careful formulations to explain the SWP’s then revolutionary politics. At that time, IP was the official periodical of the Fourth International (FI), the world revolutionary socialist organization with which the SWP maintained fraternal relations. Reactionary U.S. legislation prevented the party’s formal affiliation, as it does with Socialist Action today. Gerry remained on the SWP staff for some 17 years, writing for all its publications, with his articles often reprinted by FI sections. His journalistic assignments took him to Portugal, where he covered the 1974-75 revolution, which overthrew the fascist Salazar dictatorship. He also traveled as a reporter to Iran, when in 1979 a revolutionary wave swept from power the U.S.-backed and installed Shah of Iran and opened the door wider than ever to a socialist transformation. In both cases and in all other instances where Gerry’s knowledge, reporting, and language skills took him to far-off places to cover revolutionary developments, Gerry collaborated with the FI groups in those countries, which were active in the mass mobilizations. Gerry left the SWP in 1980 to take a staff position on the FI’s new publication, International Viewpoint (IV). He remained in Paris on this assignment for more than a decade. His departure from the SWP, which expelled Gerry retroactively, stemmed from his opposition to the bureaucratic and cult-like practices of SWP National Secretary Jack Barnes, who, along with a compliant new “leadership team,” engineered the SWP’s rejection of its Trotskyist heritage. This was accompanied by the expulsion of hundreds of its most dedicated comrades, including many of the SWP’s founding members from 1938. Many of these comrades soon after formed Socialist Action. Relocated in Paris, Gerry was a staff writer, translator, and often a speaker for IV at conferences and conventions of FI sections. He authored hundreds of articles covering critical events in world politics and joined the French section of the FI, the Revolutionary Communist League (LCR). Beginning in the late 1980s, Gerry’s mastery of Slavic and other Eastern European languages, and his keen interest in the mass movements in the USSR and Eastern Europe that challenged Stalinist rule, allowed him to author scores of articles that provided great insight into the revolutionary developments in these countries—especially the critical struggle of the USSR’s oppressed nationalities. Gerry’s assessment of the importance of these developments coincided with Socialist Action’s. For the first time in decades the possibility of building Trotskyist parties in Eastern Europe and the disintegrating USSR had real and immediate potential. He supported Socialist Action’s efforts to send Trotskyist delegations to Eastern Europe and the USSR as well as our contributions to the building of a Trotskyist party in Poland, including the translation into Polish of some important works by Trotsky. In the early 1990s, Gerry returned to the U.S. to work full time for Socialist Action as the International Editor of our newspaper. Typical of Gerry, however, before leaving IV, he insisted that we underwrite his proposal that he visit Hungary for three weeks so he could “learn the language” and more effectively follow events in that country. Back in the U.S, Gerry was immediately co-opted to Socialist Action’s Political Committee, where his knowledge of Eastern Europe and the recent events in the USSR contributed greatly to the depth of coverage in our press. 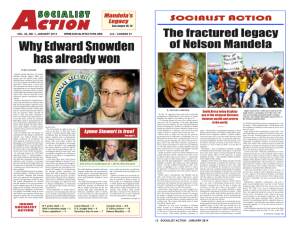 Socialist Action newspaper’s coverage of revolutionary developments in Eastern Europe, Latin America, and Ireland were remarkable in their detail and analysis, often from first-hand sources or direct participation in the unfolding events. Gerry eagerly took on assignments around the world. Following the Zapatista rebellion in Mexico, he visited San Cristóbal, Ocosingo, and other cities that the Zapatistas had temporarily occupied, to learn first hand of their impact and to meet with their representatives. An incident related to the Zapatista rebellion comes to mind that highlights Gerry’s desire to directly connect with the people whose struggles he embraced. I visited San Cristóbal to try to meet with the Zapatistas and to observe their negotiations with the Mexican government, which temporarily ended their first uprising in 1994. Before I left for Mexico, Gerry asked me to bring him back a dictionary of the language of the indigenous people. At the time, such an effort was the last thing on my mind. But by coincidence, during a press conference following the negotiations, a fellow walking through the aisles was hawking just such a dictionary, and I thought that I would bring it back to San Francisco to surprise Gerry with my ability to make good on his essentially eccentric request. I gleefully handed Gerry the dictionary upon my return, and he quickly opened it. In a moment, with perhaps a tiny hint of disdain, Gerry said, “This dictionary is Tzotzil. I need to begin with the major indigenous root language, Nahuatl. It won’t do me much good.” Vintage Gerry! I am sure that comrades who knew him have thousands of similar anecdotes highlighting Gerry’s magnificent eccentricities. Gerry Foley touched the lives of revolutionaries around the world, including comrades from other socialist currents that do not share our politics, program, and traditions. Socialist Action has received condolences from many comrades outside our movement, comrades who might have differences with us on important political questions but who respected Gerry’s diligence in presenting our ideas and who benefited from the material that only his skills and experience could provide. Gerry was one of a kind. To know him was to be enriched in myriad ways. He lives on in our deeds and dedication to the revolutionary cause and program that he championed for a lifetime. A memorial meeting will take place in the S.F. Bay Area on May 28, and in New York on June 10. See the website for times and locations. > The article above was written by Jeff Mackler, and first appeared in the May 2012 print edition of Socialist Action newspaper.